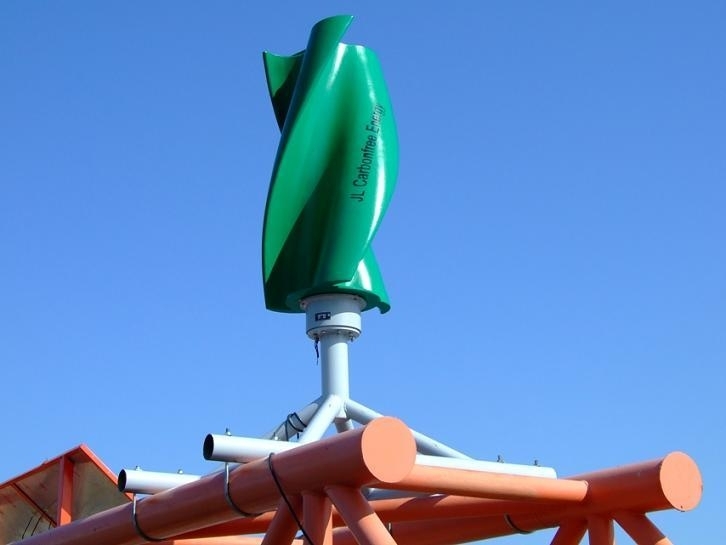 Small vertical axis wind turbines (VAWTs) possess the ability to effectively operate in the presence of high turbulent flow, which makes them ideal energy harvesting devices in urban and suburban environments. In a new article, researchers present results indicating that an optimally designed VAWT system can financially compete with fossil-fuel based power plants in urban and suburban areas, and even spearhead the development of a net-zero energy building or city. According to a prediction made by the U.S. Department of Energy, wind energy could provide 20 percent of electricity in the U.S. by the year 2030. This has motivated researchers from the University of Utah's Department of Mechanical Engineering to investigate the performance capabilities and financial benefits of vertical axis wind turbines (VAWTs) in urban and suburban areas. A VAWT is a wind turbine design where the generator is vertically oriented in the tower, rather than sitting horizontally on top. While there are many VAWT designs, the one used in this study is called the straight-blade Darrieus type or H-rotor turbine. According to the researchers, small VAWTs possess the ability to effectively operate in the presence of high turbulent flow, which makes them ideal energy harvesting devices in urban and suburban environments. In an article in this week's Journal of Renewable and Sustainable Energy, from AIP Publishing, the authors present results indicating that an optimally designed VAWT system can financially compete with fossil-fuel based power plants in urban and suburban areas, and even spearhead the development of a net-zero energy building or city. To establish their results, the team input actual, time-resolved wind speed data into a numerical simulation that determined the total amount of energy captured by a turbine over a year of operation. Their wind data was accrued over the year 2009 from 3-D sonic anemometers mounted on the top of traffic posts, about 9 meters, or 30 feet, above ground, and positioned at nine different urban and suburban sites around Oklahoma City, Oklahoma. The researchers simulated 13 different wind turbine configurations, with a focus on four particular design parameters: height-to-diameter aspect ratio (H/D), blade airfoil shape, turbine solidity and turbine moment of inertia. The main performance measure used to identify the optimum design configuration was the percent of energy captured by the turbine over the course of the year relative to the available energy in the turbulent wind during the same time period. Of the 13 design configurations, the optimal turbine design had the lowest moment of inertia. Interestingly, however, the researchers confirmed that even with the moment of inertia eliminated as a design parameter, this configuration was still the most ideal. They also analyzed the various turbine designs for the levelized cost of energy (LCOE) at one of the test sites and found the values for blade characteristics necessary for economically viable options. The optimal design configuration at this site produced electricity at a cost 10 percent lower than the average national electricity unit price. "This is not the end of our research, and I think that we have more to study on the turbine design configuration and its operating conditions that would allow for enhancing the amount of energy captured by the turbine. [...] It's exciting," said Lam Nguyen, one of the lead researchers on the project. Nguyen is currently expanding his research with a former advisor. Following their conclusion that an optimal design configuration for VAWTs could lead to a lower electric cost, the team knows the work is not finished.